I have a late 2011 MacBook Pro with 16GB RAM (system max) and a 1TB SSD. The drive has two partitions – one running MacOS Sierra 10.12.5 and the second running Mavericks 10.9.5 (for purposes of keeping commercially licensed software that is now only available as monthly/annually-paid subscriptions). This is the most complex setup I've ever attained, just to give you an idea of my technical expertise. Before making any build changes that potentially “break” my current setup, I wanted to reach out for advice as to what is/isn't possible and the best method to achieve a system capable of accessing the three OS's. As I've researched, part of what I'm struggling with is perhaps not fully understanding how virtualization works. I'm not sure how much I can rely on it, hence keeping native bootable drives for each in my setup. Can I use Parallels/Fusion/other to run my EXISTING Mavericks drive within Sierra or will I have to reinstall the OS and legacy applications through virtualization software? Assuming a setup in which Mavericks can be run virtually in Sierra, will I be able to run Mavericks natively by rebooting to it as my Startup Disk if/when needed? If I add a Bootcamp-built Windows partition, can it also be run virtually in Sierra (or do I have to choose one or the other)? In my opinion a set-up covering all three scenarios is possible but it requires a lot of work and the whole thing is probably fragile and won't survive upgrades or special updates of either of the partitions. Parallels Desktop as well as VMware Fusion allow to use the Boot Camp partition as virtual machine without losing the ability to boot to the physical volume. In the past this feature had some hick-ups though (e.g. loosing Windows activation). Triple boot macOS 10.12/OS X 10.9/Windows should be covered by one of David Anderson's answers. One answer showing the basic approach can be found here: Installing Ubuntu on Mac with macOS and Windows already installed. Install a basic OS X system (Sierra), install Windows with the Boot Camp Assistant. 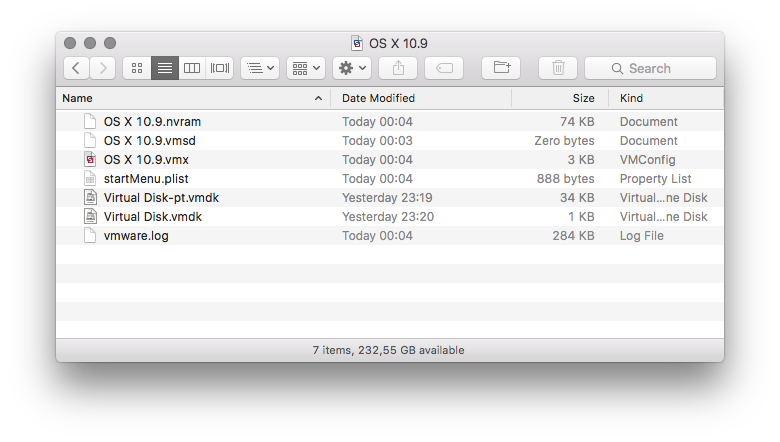 Resize the Sierra partition without touching the Windows partitions, add a partition for Mavericks and install Mavericks (or backup & resize-clone your current Mavericks partition). Create a basic OS X 10.9 virtual machine without installing anything. Shutdown the VM and quit VMware Fusion. This will create a vmwarevm bundle. Open the package (right click > Show package bundle). Open Terminal and enter diskutil list. Determine the partition numbers of the EFI, the Mavericks partition and the Mavericks recovery partition (probably disk0s1, disk0s4 and disk0s5). Unmount the Mavericks volume. Change directory: cd "/Applications/VMware Fusion.app/Contents/Library/"
Launch VMware Fusion and configure the OS X 10.9 VM (processors/RAM/network - bridged devices). Launch the VM. This is tested with a full Mavericks system on an external thumb drive using an El Capitan host and it works. Mavericks and El Capitan both were and still are bootable as real systems. If your SSD contains one or more CoreStorage Volume Groups it's more complicated. I would revert to the standard OS X partition scheme first. Virtualize everything except Sierra because a simple error/user mistake in the set-up outlined above may render all systems unbootable. Not the answer you're looking for? Browse other questions tagged mavericks sierra windows partition virtualization .